Boa constrictors are distinctly big snakes -- some of the biggest on Earth -- but that's not the only distinctive thing about them. From the color patterns on their thick, strong bodies to the tiny teeth that line their mouths, these snakes are covered with distinct physical traits that make them highly recognizable. Boa constrictors are also particularly deadly reptiles, and can use their strength and their looks to their advantage when hunting. While there are different types of boas, they typically fall in roughly the same size range. Boa constrictors are usually around 13 feet long and weight about 60 pounds, though they can grow to weigh more than 100 pounds. These snakes have thick bodies, which they use for navigating the environment, killing prey and even carrying their young -- a female boa constrictor gives birth to live babies, and can carry as many as 60 at a time inside her enormous frame. A boa constrictor's skin sports an elaborate color pattern that can include ovals, circles or even diamond shapes. 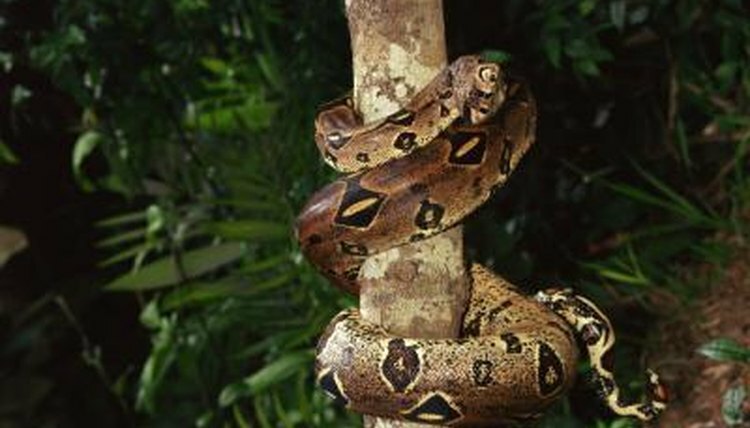 Their coloring depends mostly on their environment and is meant to camouflage them, as a boa's hunting strategy consists largely of ambushes and surprise attacks. A typical boa constrictor's coloring is a pale, neutral solid color, like cream or gray, adorned with the aforementioned shapes in a pattern that runs the length of his body. This pattern usually consists of shapes colored red, green or yellow and outlined in black. The boa constrictor's head, inside and out, it also distinct. For example, on either side of his head are two pits, which he uses as heat sensors to help him read his environment. Inside his mouth he has neither fangs nor venom, but smaller teeth that he uses to hook his prey and hold it in place while he wraps his massive body around it. He's also able to unhinge his jaw, allowing him to swallow prey as big as monkeys and pigs. Because they have such strong bodies, boa constrictors look like climbers -- and they are. Their bodies are big and strong enough to squeeze their prey to death, and they use that strength to climb trees, wrapping themselves around branches to stay in place. A boa constrictor's size and strength aren't just for show -- they make him a formidable hunter and a deadly adversary.